Hello, dear fans. I want to share with you by history of the launch of Russian fanfiction from fan group Steedumbrella. Partly I revealed the history in the book Avengerworld, but today we go with you the details of the events that led to the development of this direction. I often thought about whether there are other people outside Stedumbrella group in Russia who wrote Avenger fanfics. I speculated that if someone could write fanfics earlier there, then it will be the earliest in 1994, I think, when the series was first broadcast in Russian there. Although some episodes with Emma Peel were aired without translation in the early 1990s on TV channel 2x2, it was a curious period as in TV schedules that time, did not indicate some programs. Moreover, The Avengers transmitted on TV channel 2x2 (like later on channel Saint Petersburg in mid-1990s) when people mainly were on job or educational institutions, so it could be seen if you were at home due to illness or other important reasons. For all the time I have met only three people who remember The Avengers on channel 2x2, and they all wrote that more prefered to a series "I Spy" - The Avengers and "I Spy" alternated by episodes on TV channel 2x2, and while "I Spy" has been specified in some TV schedules, The Avengers - no. One day I wrote the message in Avengers group VK on topic about creating Russian fanfics that later I would have posted on the site. Despite the interest of some Russian, as result people prefered for already written Russian stories or foreign, if knew language properly. Oh, there is no specific answer to the question - today I still come to the old condional point that likely in Russia only members of the group Steedumbrella worked in this direction. I'll start with the narration about Alexei Sidorov characteristics and other, on first look, far points, that actually help us to make a good look at the first fanfic. I met Aleksei at the end of 1995 in college, where we studied, and although it was occasional quick engagement on breaks, I felt that we have something in common in the manners and worldview. I was at the time in a different group of people, and my colleagues do not particularly positive him to give me some doubts. Everything changed after one situation, which I described in the book Avengerworld, and when in winter 1996 I entered the circle of already established group (Sergey Pronin Alexey Arsent'ev and Alexei Sidorov), I soon discovered that Alexei Sidorov and I have more in common - exactly strong attachment to their own creativity. Yes, we were really obsessed with it. Aleksei and I have created different comics and stories directly on the classroom in college - we were only two people there who did it. Nevertheless, it not compromised the quality of our study, our team as a whole has been diligent in many things, and we allow ourselves to our creativity only at those moments when you for example have finished your task and have to wait to any of the teacher's signal or bell for finishing the lesson. Aleksei Arsent'ev and Sergei Pronin were other characters as for creativity in clasrooms, and in those situations when A. Sidorov and me created the fanart, they played some games on paper, the most popular of which was "Questions and Answers". A fun non-standard game, which maybe Aleksei Arsent'ev was creator - sometimes we played together in it and once there was something connected with the Avengers in game "Questions and Answers". More on that another time. I will need to ask about it for add details, already vaguely remember this point. Aleksei Sidorov was a huge Sherlock Holmes fan, he sometimes imitated Russian actor Vasily Livanov who played the character, discussed these Russian films, works of Arthur Conan Doyle, etc. He had a pipe smoking at house (although no one in our group had never smoked, and does not smoke), with which he looked exactly like mentioned actor. I was at that time already also fan of detective stories (thanks to the Avengers), and Sherlock Holmes was the first with which I began to introduce in this genre, since last year in school. Besides Aleksei was fascinated the British comedy serials (Benny Hill, Mr. Bean, The Baldy Man, and others). Although I must admit it was the single genre that we have received great pleasure all four, defibetely that affected on our work about the Avengers too. The last major stroke of Aleksei's hobby was a policy that was the core of his manuscripts about the fictional country of Linzia, in which often broke out conflicts and it was necessary to solve the situation of the trickiest or smart ways. 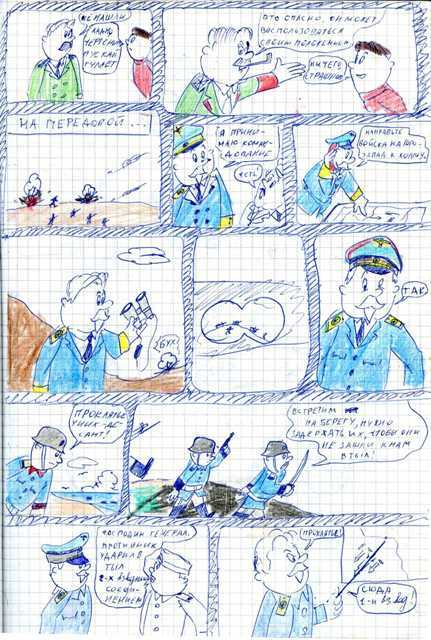 At the time of my entry to the established group, Aleksei Sidorov worked on comic story "Iron General", which he began to create since 1995 - this was one of those stories where in Linzia in full swing was war and the course of events was unpredictable. Sergey Pronin, Alexey Arsent'ev and me were not very interested in these ups and downs, but as whole we satisfied with the quality of his graphics. 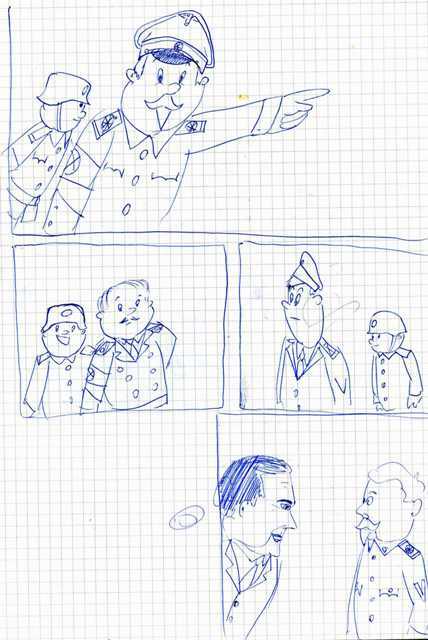 Subsequently, in the comic story Iron General appeared a drawing with Steed and it is in this notebook was written first Russian fanfic by fan group Steedovtsy. But we're getting ahead of ourselves. To be continued... Stay Tuned. "Matter of minute"- first Russian fanfic of Alekei Sidorov will be presented for the first time ever on correct English. You will learn why the story was written at all, as Aleksei did not planned it. Details of creating at lesson at the College in May 1996. 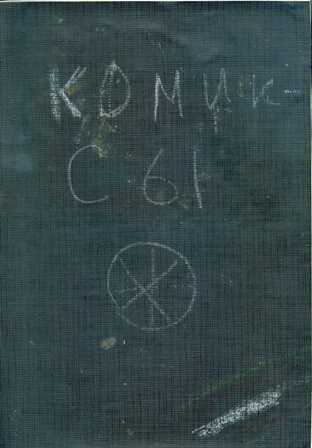 Scan of notebook cover for the first time ever. And other interesting things I did not say in the book AVengerworld. See you soon, dear fans! I'm trying to remember when I for first time saw Aleksei working on comic story Iron General in a exercise book on format A3. I think it was the first half of the spring of 1996. Sergey Pronin and me, as usual, sat on one of the lessons of one desk behind two Alekseis, and at some point, when the teacher left the classroom, Alexey Sidorov reached into his briefcase and pulled out a black exercise book. What did all this mean I did not know anything then. So-so. I distracted from some task that I have not yet finished in my notebook, and began to curiously to watch for the actions of Aleksei. He opened this black book and began to draw something quickly there. Aleksei Arsent'ev too distracted from some task and began something to comment on events in the narrative of this story. When Sergey was involved in the discussion, then I saw that A. Sidorov was working on scenes "expedition in an unknown demi-island" for own comic story (it was in the middle of storytelling). Subsequently, this in my opinion was the most exciting part of the story, because there is a feeling that Aleksei went by the way of the plot of the episode The Superlative Seven, which was shown on TV channel TV6 in Russia on January 14, 1996. Plot of this event was following: after the expedition rejected a warning of unknown man that they must leave the territory of demi-island, soon there began the skilful murders of members of the group, one for the other, by one. Considering that such situation was in very unusual manner of author, it seemed obvious to me that when we started discussing Avengers series in spring of 1996, when Aleksei exactly was working on these scenes, he decided to absorb some elements of the mentioned Avengers episode in some event of comic story. Thus we can say that the fan-comic Iron General was the first Russian work, where has been the influence of The Avengers. In May 1996, it became clear to the team, that the comic book Iron General will soon be completed, because at first Aleksei planned to finish it in any way before the end of the second training course in college (which ended in June), second, after he finished the event of the expedition on an unknown peninsula, and returned to regular military actions, my interest in his work again began to fall (the others did not have it throughout author's whole work). At some point Aleksei began a rapid pace disclose vicissitudes of in the story and I think that we all subconsciously waiting when he will make an announcement about the end of story. Day of surprise came at a time when in the air was atmosphere of coming summer - lessons with homework became more lightweight, and you mainly relaxed plunging into thoughts on how you will spend a vacation. Although the training course coming to the end in late June, but from September to May you studies different subjects in the classroom + selected days you passed practice in the profession, and in June, you does just the practice. 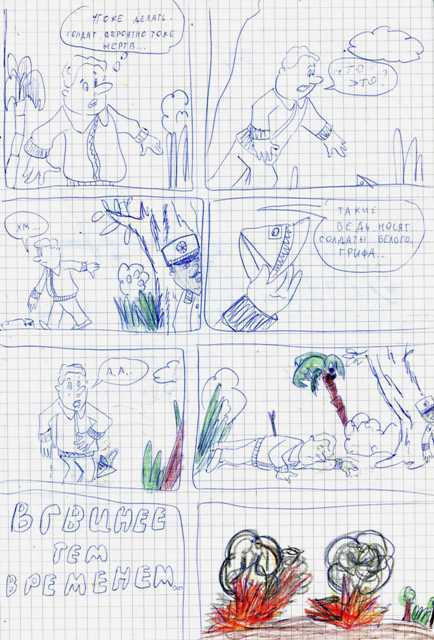 On that day, on one of these lightweight lessons (I think the subject of physics), when teacher was again outside of class, Aleksei took a black exercise book from his briefcase and drawing a few pictures said that comics is completed. His colleague by desk ironically commented it, we listened to the final passage of comic story, and Aleksei Sidorov suddenly informed that hands me this comic book as a gift. I said that it would be best if he left comics for himself, because I'm will hardly reading it, while the author himself possible will interested in some events in history there that will help him in the future for other plots about his fictional country. Aleksei said that the idea to give me this comic book as gift came to him when he with me began to discuss the events in story about the expedition. During the ensuing discussion, I realized that he would like me to have studied the characters of his fictional country, and we could continue to work together for these stories about Linzia as following: he is a writer and an artist, and I am a consultant for some cases. Ha, however, I gave up all of its terms , I had no desire to be a member of Linzia, so to speak, so at some point Aleksei mused, and suddenly recollecting himself began to write something on a single free page at the end of the comic story. Hmm What's happening? Aleksei Arsent'ev tried to distract colleague on some debate, but in response we hear from colleague something like "Quiet, I have to focus". It took about a minute, when he showed us a short story which was called Matter of a Minute (Russian: "Минутное дело") - the first Russian story about Steed, that maybe it is. When Aleksei gave me this black exercise book, we still did not know the contents of the story. He said, "Read". I looked at the first words in the story and was fanned by a wave of happiness at the same moment, as story began with the words "Mister Steed". Yes, it was a real gift from Aleksei, we knew that he is a good writer. We asked Aleksei to read it aloud to us, as he was the author, and we all want to hear the story from him. He did it and although the story was very simple and performed in a manner of stories about Sherlock Holmes, Aleksei performed admirably reading, and I felt that our team has become closer to the Avengerworld. After some time, today I will post this story in English here. Short story "Matter of a Minute"
Mister Steed opened the door of his flat and thought, "It would good to drink a cup of tea right now". He turned on the light and found his belongings scattered, the drawers are pulled out. - Apparently, thieves - he said. After good inspection, it appeared that nothing was stolen. At the threshold Steed noticed a long hair. He carefully put it in a small box. A few hours later he was visited by several police officers. - Sorry to trouble you, but in next door was a robbery, stole a painting and valuables. Mister Steed told them about what had happened in his flat. - Most likely this person are a woman, acted on a tip from someone who visited that flat. - Mr. Steed brought the cutlery glasses. - You need to find the suspect and compare the hair which I found with hairs of the alleged thief. Looking for the person with long brown hair. On next day, the offenders were found - this was a woman named Catherine Bolks and gunner Tom Anderson, familiar of victims. - I was right - said Steed and raised his glass. Interesting facts about Short story "Matter of a Minute"
Since Aleksei Sidorov had previously little experience in writing of detective literature, he took the main characteristics for the protagonist John Steed from image of Major Cromwell - one of the leading characters of their own fiction series about Linzia - adding to it the necessary qualities detective, deductive methods of Sherlock Holmes. Though, this story is so short that any reader can hardly feel the character of John Steed here in different ways, actually. Author previously rarely described in his writings of the female character, so he rejected the idea to include in the story of any female partner of Steed. After Aleksei read this story, we briefly discussed the plot, and I agreed to take the exercise book as a gift. It was already not any doubt. Before giving it to me, Aleksei drew Steed on one sketch illustrations for comic book Iron General. Well, at the moment when I saw it, I wanted to Steed appeared in the comic book, too, Aleksei seems felt it and said something like, "I drew where could afford". That day I learned at home whole comic, and appreciated it at the highest level, regretting that the earlier tried to ignore it. I decided that I should start cooperation with Aleksei that soon led us to the creation of regular fanfics about Steed (however, intially we worked together, then separately - for best result).